Dropped for me finally in "S.H.I.P. sabotage!" mission after no-idea-how-many-hours killing (but not too many :)). I got 3x Ocular Scout Control Unit's for all 100 lvl alts clearing 1st and 2nd SHIP missions with my 105 ranger. So after 3rd drop I logged on 85 lvl wiz and initiated a mission with 85 WIZ + 105 RNG + 105 healer mercenary. Immediately I noticed gnomes had different pets and they dropped different armor pieces. Also they died faster then before. After 30 min killing or so ITU clickie dropped!! So - unless I had extremely lucky coincidence, I recommend to request the mission with a lower level alt. Good luck! I've cleared the instance(s) about 20 hours so far with no luck (mid Nov to Dec 2013). I'm not even sure it still drops. I will update this post with my results, whatever they may be. Update: I gave up for now to work on other things. I'll come back if I find out it does drop still. I managed to get this in Deception and Interception. I probably spent close to 30 hours of total camping with a 100+ Monk. I don't have many tips other than requesting with a lower level, I requested with 2 85's and /taskadd the monk. You can target others with it, which is very nice and it benefits from casting effects. I wonder if this has to do with level. Maybe this item drop when the group average is 80 or below and the Occular item drops if the group average is above 80. Just a though there have been missions in the past where the trash drops can be different depending on the average in the group. I'm having a hard time getting it to drop as well! If I get one I will let everyone know lol. You're not kidding, I've been trying for this off and on for years. Every so often I get a wild hair and go back and clear for six hours and get the mission again next day, clear for six hours, and I give up after about 6 instances or a week or so.. I've gone through four instances again this month with no luck. I keep getting these pieces of junk Ocular Scout Control Unit from S.H.I.P. 1, which isn't even listed as a drop on either page for S.H.I.P. 1 or 2! Will anyone clarify on those who have gotten it, what instance it dropped from? 1, 2, not an instance... etc? I'm happy to see people have gotten it, but where did you get it? I see one person saying it's from S.H.I.P. 1 and one person saying it drops from S.H.I.P. 2, and a couple that just say they got it, but not from what instance. This game is going to drive me insane and I just keep playing. anyone seen it this year? We had one drop in the SHIP mission #2. SHIP Sabotage. and it came from a gnome trooper on the 2nd floor. 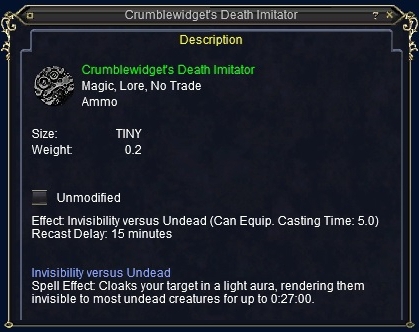 I got this item a couple days ago (dropped on Aug. 4, 2012). It did NOT drop from an evaluation specialist. I was clearing the first floor room in a circle and it dropped of one of the other gnome's (forget it's name - sorry). So - my advice is to just keep clearing that room. I am wondering if this item still drops. I have probably killed a couple hundred evaluation specialists so far and have not seen this drop. I heard this only drops in the instance version of the zone can anyone confirm this?